President-elect Donald Trump, shown here at a campaign event in Dallas in September, has filled his prospective Cabinet with opponents of carbon regulations as well as a number of officials who question established climate science. Photo courtesy of AP Images. It was just one year ago, and from the White House on down, everyone who worked to make the Paris climate agreement a success was dizzy from victory laps. "Together, we've shown what's possible when the world stands as one," said President Obama, lauded at the time for cementing his legacy on climate issues. A commitment to reduced emissions will be an "economic bonanza," pledged Secretary of State John Kerry. "We're not slowing down in the year ahead," promised U.S. EPA Administrator Gina McCarthy. "This was a year, from December of last year through the beginning of November, where the pace of action, the pace of consensus of world cooperation on climate change, was just building," said David Doniger, director of the climate and clean air program at the Natural Resources Defense Council. In one year's time, the Earth saw the hottest global temperatures in modern record-keeping. The Supreme Court stayed the Obama administration's signature climate achievement, the EPA-overseen Clean Power Plan. High temperatures led to the largest die-off of corals ever recorded on Australia's Great Barrier Reef. In the Arctic, sea-ice cover was tied with 2007 for the second-lowest amount ever. In the Antarctic, research emerged showing that the continent's ice sheets are breaking from the inside out as ocean temperatures rise, raising concerns that as more ice melt enters the oceans, cities worldwide face an accelerated, unforeseen timetable to address sea-level rise (see related story). And in perhaps the most significant climate development of all, U.S. voters elected a president who said on the campaign trail not only that he would pull the country out of the Paris deal as rapidly as the first day in office, but also that the Obama administration had focused on climate at the expense of the threat of "nuclear global warming." Donald Trump's words in late 2015, in an interview about the Paris deal with Steve Bannon, the right-wing media master who will be the president-elect's chief political strategist, might have been most prophetic of all. "We are fools," Trump told Bannon. Nonetheless, there's much that an election can't reverse, including market forces and the country's innovation capacity, say Doniger and others who monitor energy and climate issues. State and local governments continue to make investments in clean energy policies as well as building codes and land-use planning that lower emissions and hedge against the risk of hazards such as extreme weather fueled by global warming. The cost of renewable energy continues to go down, and the electric system continues to move away from coal and carbon-intensive sources of fuel. "It's true, obviously, that the election surprise changes what our federal government will be likely to do," Doniger said. "But I think the surge in global commitment to act in all of the big countries, and below Washington, in the states and the cities, there's another surge in commitment to act. These trends are not going to be stanched by the Trump administration." A Trump administration also gave environmental and climate advocacy groups a rallying cause. In just one week after the Nov. 8 election, the Sierra Club added 7,500 monthly donors. That was more than the environmental advocacy organization had added in all the rest of 2016. "This year, there's a mix of hope and concern," said Alden Meyer, director of strategy and policy for the Union of Concerned Scientists. "There's some trends that give you hope things are moving in the right direction, and there's others, including some of the political dynamics, that give you grounds for concern. "But it doesn't mean you give up. You have to keep making the case that the decarbonization of the global economy is in the long-term interest of the U.S., of business, of security." People in the business community are also making a case for maintaining funding for research at the national energy laboratories and in other areas, both Meyer and Doniger said. "This has economic consequences, competitiveness consequences," Meyer said. 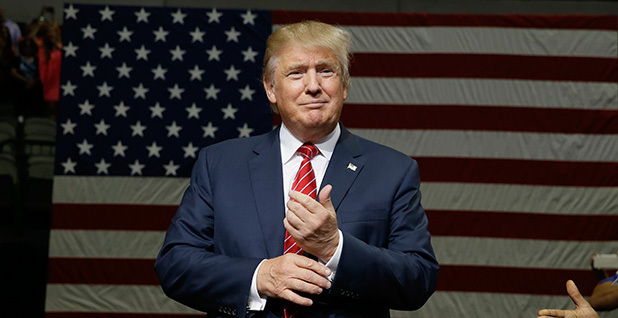 "It translates into markets and jobs for American companies and workers." As the year comes to a close and a new presidential administration began to take shape, E&E News reporters looked at some of most memorable events in the world of climate change. Will Trump's team 'put the torch' to the Paris Agreement? 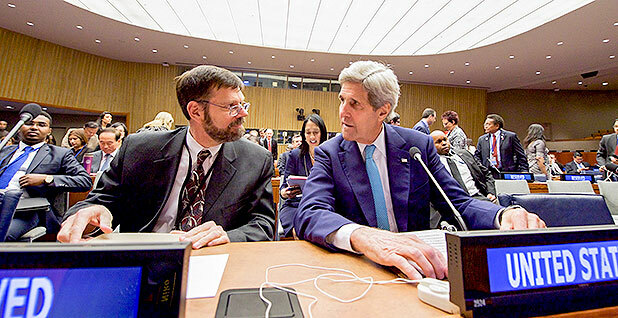 Secretary of State John Kerry (right) sits with U.S. Special Envoy for Climate Change Jonathan Pershing in April at U.N. headquarters, where the Obama administration formally joined the Paris Agreement on climate change. Photo courtesy of the State Department. The Obama administration spent much of 2016 laying the groundwork for implementation of the Paris Agreement. The deal took effect early after 55 countries — totaling 55 percent of the world's emissions — signed it by October. Obama and officials at the State Department and other agencies were instrumental in ushering it across the finish line. They also helped nail down a long-sought amendment to the Montreal Protocol on Substances That Deplete the Ozone Layer limiting heat-trapping coolants and refrigerants, and another deal curbing aviation emissions. "The message of Paris is that the time is now to undertake a permanent transition to a new and low-carbon energy future for the world," Kerry told a military audience at the National Defense University in Washington, D.C., in January. "And I can tell you, from the evidence that I see, this message is being heard and integrated into policies by prime ministers, governors, mayors all around the world — by energy corporations and investors, by innovators and entrepreneurs, and by consumers and civil society." But Trump's election threw those developments into doubt, as his transition team began looking for ways to make good on campaign promises to withdraw the United States from the Paris Agreement and further involvement with the United Nations. The president-elect also picked Exxon Mobil Corp. CEO Rex Tillerson to lead the State Department, a signal that energy interests would take priority in diplomatic considerations. "Obviously we're going to need to see how it plays out," said Todd Stern, the former U.S. special envoy for climate change who helped land the Paris Agreement last year. He noted that Tillerson praised the Paris accord as Exxon's CEO. "I know that there will be people inside the administration who would be happy to put the torch to any U.S. participation in Paris, but I'm not going to make any assumptions about what the final decision's going to be," he said. Meanwhile, conservatives at the Heritage Foundation and elsewhere say they would like to see a willingness to withdraw from Paris as a litmus test of sorts for any member of the incoming Trump administration (see related story). 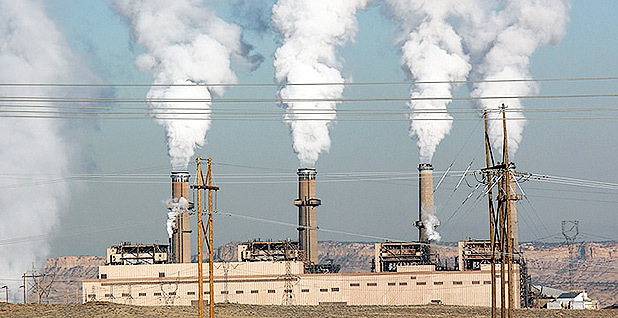 The Four Corners coal-fired power plant, near Farmington, N.M., is one of hundreds of plants that U.S. EPA aimed to regulate for carbon emissions under President Obama. Those regulations are now likely to be overturned by the Trump administration. Photo courtesy of Los Alamos National Laboratory. Trump also has vowed to kill the Obama administration's Clean Power Plan, a regulation to reduce greenhouse gas emissions from the power sector. The rule, which is the foundation of U.S. global commitments to curb climate change, saw a tumultuous year. Twenty-seven states oppose the regulation and are challenging it in court. Yet after EPA released its final rule in August 2015, even reluctant states began discussions about how to comply. Most states were looking at using an emissions trading system to meet their specific carbon standards even as they worked to limit costs to consumers. With carbon trading, a power company that doesn't shift away from coal enough to meet federal requirements could buy credits from a utility that invested more in green power. Overall emissions would still decline. But then in February, the Supreme Court in a surprise decision froze implementation of the Clean Power Plan. The U.S. Court of Appeals for the District of Columbia Circuit will determine this winter whether EPA exceeded its authority in writing the rule. The losing side is expected to appeal to the Supreme Court. Trump is likely to initiate a rulemaking process to rescind the Clean Power Plan. His pick for a vacancy on the Supreme Court could also be the deciding vote on whether it should stand. "I know there is a lot of anxiety these days, but I am very hopeful for a few reasons," McCarthy, the EPA administrator, said in a speech last month at the National Press Club in Washington. "We have done our job, and the environmental enterprise is more inclusive and more effective than ever. We've energized the American people, who will demand not only clean air and clean water for their children, they will demand a stable planet." Environmental advocates insist that Trump and Republicans in Congress will not be able to reverse the overall trajectory toward lower-carbon power as natural gas has stayed inexpensive and renewables get cheaper. In a blog post this week, EPA air chief Janet McCabe noted that carbon emissions from electricity in 2015 were already nearly 25 percent below 2005 levels. The Clean Power Plan aimed to achieve a 32 percent reduction by 2030. "I know we have a heck of a fight ahead of us, because they will be trying to unravel many policies," Doniger said. "But those policies are actually quite difficult to unravel. We'll be using every tool there is, including the court of public opinion and on the Hill, to block those efforts." Meanwhile, the Department of the Interior, which manages millions of acres of public lands onshore and offshore, bolstered climate in many of the agency's policy actions in 2016. The department finalized a rule that limits the release and burning of natural gas, of which the potent greenhouse gas methane is the primary component. The agency said the Bureau of Land Management rule, which cuts methane waste from oil wells on public and tribal lands, could reduce methane emissions from the oil and gas sector by as much as 35 percent. EPA also issued final rules regulating methane emissions in the oil and gas sector and municipal landfills. Both were part of the Obama administration's long-term goal to help the United States reduce methane emissions by 40 to 45 percent from 2012 levels by 2025 (see related story). The agency also finalized new renewable fuel volumes under the renewable fuel standard, increasing the total volume for 2017 to 19.28 billion gallons (Greenwire, Nov. 23). The Interior Department this year also announced it would freeze new coal leases for three years while it conducts a programmatic review of the federal coal program, the first since the 1980s. The review is likely to be scrapped under the Trump administration. Greenhouse gas emissions continued to rise to record highs in 2016 despite increases in vehicle fuel efficiency and incentives for non-polluting vehicles. Photo courtesy of Flickr. On the industry side, things were rocky this year. Coal began 2016 with plunging production, idled furnaces and a spate of bankruptcies. But it ended the year with mining on the rise, coal plants humming and an ally headed to the White House (see related story). That said, coal's biggest companies were — or remain — bankrupt, and other fossil fuel-based energy companies faced additional shareholder scrutiny and a shifting market. Stockholders filed the most resolutions on climate change in U.S. history. Tesla Motors Inc. provided a blueprint to upend the utility business, merging with SolarCity Corp. And class-action lawsuits, and state and federal investigations of whether Exxon lied about its knowledge of climate science, dogged the oil giant (see related story). Those allegations against Exxon began last November, after New York Attorney General Eric Schneiderman (D) launched his probe into the firm. Resolution is nowhere in sight. The past year also saw top bank watchdogs perk up to the financial risks of climate change and policies to address it. "Once climate change becomes a clear and present danger to financial stability, it may already be too late to stabilize the atmosphere," Mark Carney, head of the Bank of England, said in a speech in Berlin. The Securities and Exchange Commission toyed with the idea of requiring companies to disclose climate risks. Such a rule now seems far-fetched, although the Group of 20, a bloc of nations with industrialized and developing economies, is finalizing a series of similar voluntary rules. 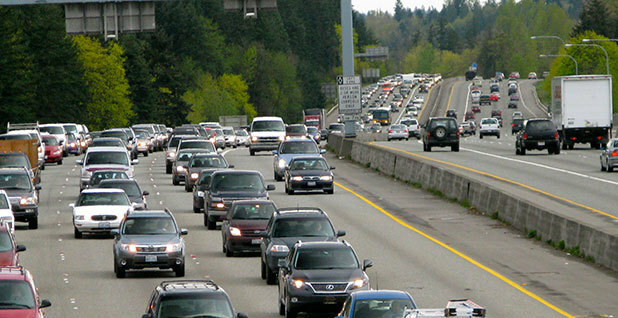 In the transportation sector, greenhouse gas emissions continued to rise to record highs despite increases in vehicle fuel efficiency and incentives for non-polluting vehicles. Amid low gas prices and a growing economy, Americans will likely have driven more miles than ever before this year, following a record-setting 2015. That pushed transportation to the No. 1 source for greenhouse gas emissions in the country, above power production, in February, according to the U.S. Energy Information Administration. The primary government policy to keep those emissions in check — the National Highway Traffic Safety Administration and EPA's corporate average fuel economy and greenhouse gas emissions standards — saw its power eroded by the low gas prices. Americans are buying SUVs and trucks in record numbers and at a larger share than the agencies had expected. A technical analysis released by EPA over the summer revised projections of average fleetwide fuel economy in 2025 downward from 54.5 mpg to just above 50 mpg. Automakers continue to meet and exceed the standards with better technology. Trump and congressional Republicans have vowed to review the rules. Sales of zero-emission vehicles have increased but remain largely below expectations, eliciting cheers when they reached just 1 percent of national new car sales. But the options have expanded, reaching more than two dozen models on the U.S. market this year. All major automakers have said they will increase their plug-in vehicle offerings. General Motors Co. and Tesla Motors revealed more affordable long-range electric vehicles that cost about $30,000 and have a range of more than 200 miles on a single charge. Reporters Jean Chemnick, Niina Heikkinen, Benjamin Hulac, Debra Kahn, Brittany Patterson, Benjamin Storrow and Camille von Kaenel contributed.